Join the discussion on our forums! 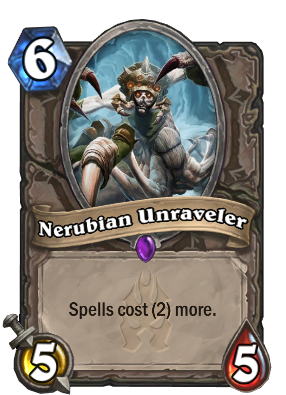 Come discuss Nerubian Unraveler over in our dedicated Nerubian Unraveler discussion topic. Still a good counter for Gallery decks, also if you are able to have two in play, you can lockdown those Psychic Screams! i really don't understand why this card didn't get enough respect. I like this card. I play first Loatheb and then follow up with this one. But i would love a buff. Something is missing. Should either be a 5/6 or spells cost 4 more. Death to the Traitor KINGGG! The difference between Loatheb could be that your opponent can just wait off the turn you play it (like mages can just iceblock pass) and then finish you off next turn with spells, but with this they have to remove this with an expensive spell (so can't use it to go face) then survive another turn and still be able to burn you. A "balanced" Loatheb... Good against spell heavy decks like Freeze Mage, Miracle Rogue, and Silence Priest. And will be great if we see the rise of Quest Mage. Dun dun dun! Can this work against burn mage? Most likely. The newer variants of Burn Mage and Freeze Mage have become very similar, creating a somewhat Hybrid Mage. This is fairly interesting. Not great, but interesting; could be very good in arena to offset all the mages and Rogues who combo spells like no one's business. Besides spell delay, actually stops play for 9+ mana spells like Call of the Wild, DOOM! and Pyroblast when used late game or in fatigue, or postpones high manacost cards until turn ten or until removal like Dinosize and Free From Amber. On the other hand its costly and maybe easier to remove because of it's stats (4/6 would be better imo). Also, Lord Jaraxxus is considered a minion, but i dont know about the new Deathknights, which could stop Jaina if her card really is legit and considered a spell. Not convinced yet, but could hold off miracle Rogue and Lyra Priest decks for a bit. Maybe ok in druid rampdecks and the like, because they have more early higher mana access?